Don Froese is a First Nations artist from British Columbia as well as a Christian. In 2008 he was commissioned by Wiconi International (an organization that works to promote community, strengthen culture and foster spiritual vitality among Native American or First Nations people) to create a carving for the World Christian Gathering of Indigenous Peoples in Jerusalem, one that would speak to the participants’ cultural and religious identity. Using the visual language of his people, Froese carved an image of the face of Jesus that doubles as a crucifixion image. It shows how Christ’s love spills out, shines bright and carries us through this life into the next. The four rays emanating from the sun-face represent the four races (red, yellow, black, and white), the four directions, and the four seasons. The top two rays contain the nail-pierced hands of the Saviour, while the bottom two contain his nail-pierced feet. These wounds extend to all peoples all over the globe. There is nowhere the Son’s light does not reach. Notice how the top two wounds appear as little orbs being held in the mouths of two smiling figures. The placement of one creature in unexpected parts of another (in this case, the hands) is a common device in Northwest Coast art known as “visual punning.” It’s a way of filling voids and is often humorous in intention but also references the Native American belief in the interconnectedness of life. Here I read it as Christians tasting the wounds of Christ—feeding daily on his grace, drawing strength and nourishment from his gift of self. Moving into the center, we see that Christ’s eyelids are weighed down by salmon, the main food source along the NorthwestCoast. The fish is a common symbol in early Christian art as well, meant to bring to mind such stories as the feeding of the five thousand and Jesus’ call to his disciples to be fishers of men. When Christianity was a persecuted religion, Christians used the fish as a secret sign to identify one another and to confess their creed: the Greek word for fish, ichthus, they appropriated as an acronym for IÄ“sousChristos, Theou Uios, SÅtÄ“r (Jesus Christ, God’s Son, our Saviour). Froese’s choice to include the salmon draws on both traditions. It’s a reminder of how Christ has sustained the church through the centuries and is sustaining her still. He is not a passive listener. His deep listening to human suffering brings tears, not just drops of tears but great blue rivers of tears which flow down to and connect with the great canoe. The rivers of tears also appear as paddles for the great canoe. The empathetic co-suffering of the Creator and Saviour with his creation propels the great canoe, giving both power for and ultimate meaning to our human journey, including transport back to the Creator. What a beautiful depiction of such a beautiful truth! God’s answer to our suffering was to enter into it himself through the person of Jesus Christ. Christ’s death on the cross becomes for us both a propulsion and steering mechanism that drives us forward into eternity, back into the arms of our Creator. This prophetic promise holds just as true today as it did for the ancient Israelites: those who travel through life powered by the love and grace of God, as shown in Christ, and who adopt his strength as their crest, will arrive safely at their final destination. 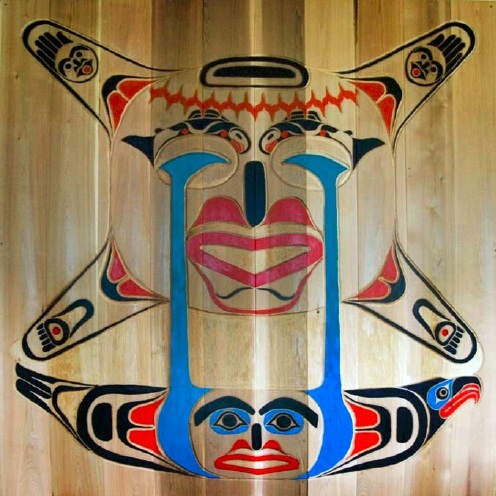 Don Froese: The Face of Jesus, 2008, carved and painted design on red cedar panel, 300 x 300 cm. This meditation was adapted from one in a series of articles originally published on www.thejesusquestion.org on depictions of Jesus in Northwest Coast art. Don Froese (traditional name: PeqYexwela) belongs to the Seabird Island Band of Stó:lÅ Nation, a Coast Salish people group living along the FraserRiver in Agassiz, British Columbia. Raised by Christian parents and trained by master carvers, Froese has been an artist for more than 25 years. Victoria Emily Jones lives in the Boston area, where she works as an editorial assistant at Shambhala Publications, Inc., a publisher of books on Eastern religions, philosophy, and art. In 2010, she received a BA in journalism and English from the University of North Carolina at Chapel Hill. A year later she founded theJesusQuestion.org, a website where she explores various conceptions of Jesus in the visual, literary, performing, and musical arts, as well as in popular culture and in churches around the world.